They are different from the traditional incandescent light bulb in that there is no filament within an LED. Instead they are illuminated by converting electrical energy directly into light - when current flows through a diode, it lights up. LEDs are used in light bars and driving lights and are becoming more and more popular. It’s easy to see why - they are about 90 per cent more efficient then incandescent lighting, they turn on instantly, produce less heat, use less current, have extremely long lifespan, and are capable of emitting extremely bright light. And by grouping LEDs together, they are able to concentrate the light they create to provide a wide and long light pattern. Are LED light bars legal? Yes. 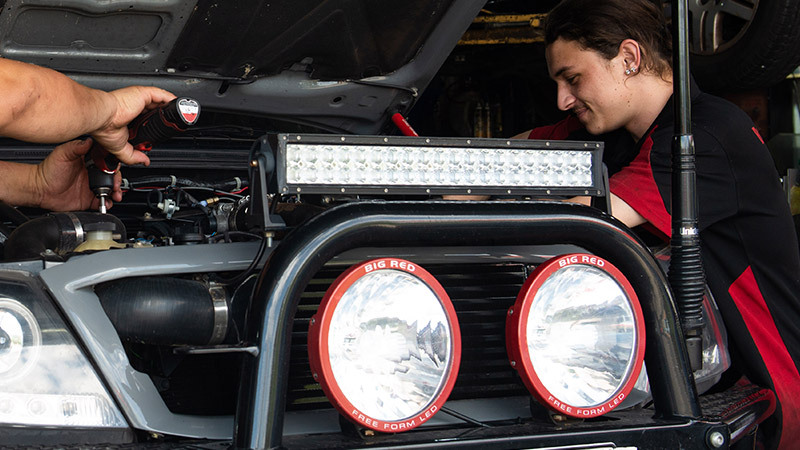 All Australian states have amended their transport laws to accommodate LED light bars. You should still check the details in your state, however, as different states do have some different mounting laws. Apart from that, all the driving light requirements are the same. There is a very large range of light bars and conventional, round-shaped LED lights available - from small single row units to long multiple row units. They also range from your entry level units with more limited output, to quite expensive units with very high light output. The choice is vast, and prices can range from as little as $50 up to $1000. Given their popularity as an off-road accessory, resistance to water and moisture is an important consideration. Given the very wide variety of LED lights and their power requirements, proper installation is vital. Some lights will use a small amount of current, whereas the high-powered bars will require considerably more. It is important that you ensure your vehicle can handle the load requirement of the bar, and also that it’s wired into your vehicle correctly and legally. LEDs are polarity sensitive (so positive and negative must be right) and it is recommended you have a professional do the wiring for you. Incorrect installation can cause very expensive damage to a modern vehicle’s electrical system. You can get a qualified mechanic on AutoGuru to do the installation for you. Search, compare and book in minutes, it’s that easy!